Beginning with version 6, we can expose Angular Components as Web Components or to be more precise: As Custom Elements which is one of the standards behind the umbrella term Web Components. They can be reused with each framework and even with VanillaJS. In addition to that, we can very easily create them at runtime because they are rendered by the browser. Dynamically adding new Web Components to a page is just a matter of creating DOM nodes. 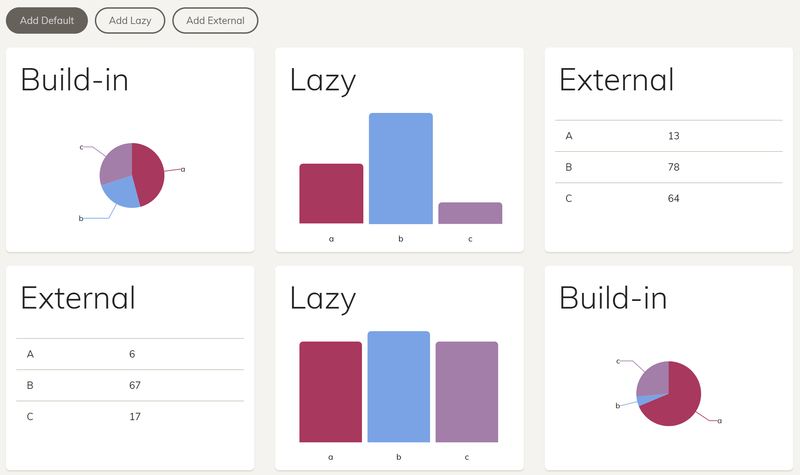 Here, I'm using this idea to build a dynamic dashboard. The source code can be found in my github repo. This example is also used in our Angular Training for Enterprise Architectures. It is no surprise that Angular Elements can be installed via npm. In addition to this, I also install the @webcomponents/custom-elements which polyfills Custom Elements back to Internet Explorer 11. It is needed for browsers that do support Web Components when we downlevel our source code to EcmaScript 5 as Web Components are defined for EcmaScript 2015+. This command also downloads a polyfill and references it in your angular.json. It is a slimmer than the one I'm using here but does not support Internet Explorer 11. I'm not using a selector because the Custom Element gets one assigned when it is registered. This way, I'm preventing naming conflicts. The method createCustomElement wraps the DashboardTileComponent so that it looks like a Web Component. Using customElements.define we can register it with the browser. If you want to make sure that your application also supports other environments -- e. g. for server side rendering or hybrid apps -- you should use the Renderer2 service which abstracts DOM manipulations.